Over the last couple of weeks we have been doing a little bit of fencing and it seemed a good idea to put a few ideas down to share. I must declare up front I hate barbed wire. It is just a pain to use. Some farmers will swear that a boundary fence must be barbed wire only. I disagree. A well made boundary fence with plain wire with two electric strands is excellent. But we each have our own perversions. There are a number of wire manufacturers and each has a range of products. Over the last 25 years we have tended to use a single product finding it appropriate to both electric fencing and non electric fencing. It is the 2.50 mm medium tensile wire. Waratah use the name Flexabel Longlife. It ties off easily and doesn't distort. If you are into professional fencing you may tailor your wires to each application. This is just a good general purpose wire for the small holder who only wants to keep one roll of wire in the shed. Every one has their own preferred method. Gripples are good and you can even get away without the special $200 tool. They still require a neat finish for the exposed ends. There is a tool to loosen the Gripple and tightening the fence (using the special tool) is simple. The tried and tested method is the standard chain strainer which almost everyone has but not everyone does a good job of it. Having a gauge to measure the tension in Kilo-Newtons is very useful if you are not an accomplished fencer. There are a few options in the gauges. 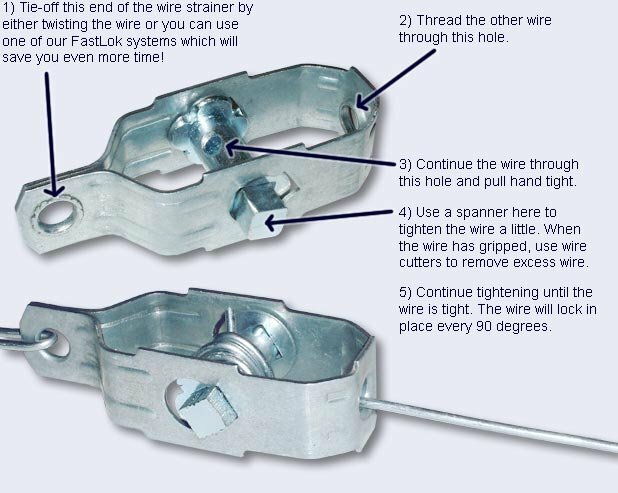 In recent years I've moved to using ratchet wire tensioners almost exclusively. They are quick to install and adjusting tension is quick and easy. And they are perfect for short runs. My preferred option is this only because it is inexpensive. There are larger and more expensive units and some come with a built in bullnose for electric fencing. There are many other tensioning gadgets and tools which work well. It is just a matter of finding one that appeals to you. There are only a few knots required. Figure Eight for joining two wires not under tension is demonstrated here. Finally the most useful not really a knot is the Cobb and Co Hitch. A tremendous topic. At our work property almost all the fencing is single wire electric and I've experiencing no major problems over ten years. In fact it has the benefit of a quick and simple repair once a tree has collapsed over the fence. Great long distances between steel posts keep the costs low. Boundary fences elicit a lot of discussion. One fallacy is that tightly spaced wires are required with calves. The truth is calves will walk through any fence. And they will walk back again when they are hungry. There is the odd calf that needs to be collected. But that is the joy of owning stock. With boundary fences we electrify the top wire to discourage leaning over and jumping. An electrified middle wire helps prevent scratching of rear ends and pushing through. Earthing the other wires adds a bit of punch to the effect on the animal. Keeping the lowest wire about 300 mm off the ground assists in preventing corrosion and provides a bit of room for returning calves and transiting wild life. Bits of wire left on the ground are not a good idea as they can be ingested by stock. Either wear a tool pouch and keep your offcuts and trimmings with you or have a 20 litre bucket at each end of a run where offcuts can be dropped as you proceed. Tie offs should be neat. You can cut off or break off the wire leaving no protruding piece which is my choice because it looks neat and can be achieved without a tool when using Flexabel wire. Some prefer to leave a long piece after the tie off so that it can be undone if needed. When leaving an excess piece make sure it is twisted back neatly and isn't poking out to take out an eye. 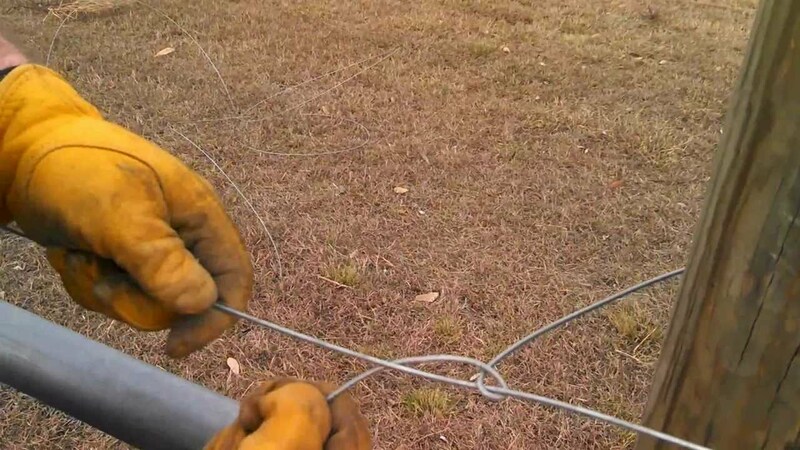 Making sure the fencing is tied tied and properly seems so important. This was one of the best articles for describing how it should be secured that I've seen. I'm working on getting a fence together for our yard once we get our fencing supplies. Thank you for sharing good information. it is a very wonderful and use able blog post.